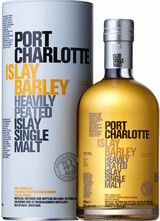 A hint of peat smoke, combined with a salty maritime flavour. Citrus orangey notes are also present in both the nose and on the palate, and the sweeter honeyed notes give our malt a smooth silky finish. Look for pleasant sweetness and spice up front, as the nose offers a complex mix of oak, maple sugar, fresh apple, clove, black pepper and cinnamon. The flavors dry to a spicy midpalate before exiting on a long, concentrated maple-like note.